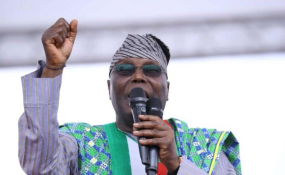 Atiku Abubakar, the Peoples Democratic Party (PDP) presidential candidate, on Tuesday pledged to complete the Mambilla Hydro Electric Power Dam in Taraba, if elected. Mr Abubakar, who made the pledge at the PDP presidential campaign in Jalingo, said the current administration had promised to construct the dam but failed to keep its promise. The PDP candidate also promised to tackle insecurity in the state and the country, to pave way for rapid development. "If elected president of Nigeria on February 16, I will complete the Mambilla Hydro Electric Power Dam within my tenure in office, to solve the problem of electricity in the state and the country. "I will also construct Federal Government roads in the state as well as refund the money Taraba spent in constructing federal roads in the state." He urged the people of the state to re-elect Governor Darius Ishaku to enable him to continue with delivering good governance. The PDP National Chairman, Uche Secondus, urged the people of the state to vote Mr Abubakar for job creation, peace, and prosperity of the country. Mr Secondus urged the Independent National Electoral Commission (INEC) to provide a level playing field for all so that the outcome of the polls would be accepted by all. Mr Ishaku assured the presidential candidate of unalloyed support by the people of the state, to ensure his victory at the polls. He noted that Mr Abubakar's candidature was a symbol of unity and progress of the country, adding that he should be supported for a better Nigeria.